Zaruma, de la Provincia de El Oro, is unquestionably the most vertical city that I have ever visited. Roads, at least those planed for motorized vehicles, are at best an afterthought throughout the entire municipality. In a city, a village really, of barely 20,000 residents there is a developed and inhabited area that marches up and down the mountain for more than 1,000 vertical feet. This isn’t a place for someone with a fear of heights. Since as you move about in just the commercial area of Zaruma alone, you move along in the street, up steps, down steps, over curbs, up more steps and then repeat. 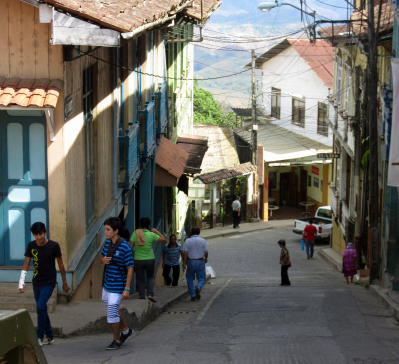 A still active mining town, Zaruma is like no other. And because of this, Ecuador has petitioned the UN to place it on the short list of World Heritage sites. It certainly has my vote. Though as beautifully unique as it is, a village this size only has so many things one can do, and with wi-fi being something that not all of the residents had heard about, keeping myself plugged-in was it’s own interesting challenge. It’s a nice, no it’s a great place to visit, but you know the rest. Three days later I hopped on a bus out of town for the most beautiful yet frightening bus ride yet. The first hour was pretty tame: we coasted downhill to the smaller town of Portovelo where I changed buses after a long wait in the town square. Within 3 minutes of leaving Portovelo the pavement ended and we started climbing up into the Andes. I was thrilled to be on this route because near the end it would meet up with the road I had taken out of Catemayo in April to attend the Natem retreat. That path ended at the door of the finca we stayed at and this ride would complete the rest of the journey coming in from the opposite direction. However these interprovincial buses are very tall affairs with great stretch out seats. They are far taller than a Greyhound back in the US, so that when we rounded bends on the one-lane gravel road and overtook an overloaded mining truck, or met an oncoming pickup, my heart lumped up in my throat as the cabin swayed along the hardpack. We weren’t making much speed, since the gravel and washouts prevented over-jouncing along the way. But we were moving about, perched 8 or more feet above the road surface. We did of course survive the trip. The drivers of these buses do this every day and know the twists and turns of their routes intimately. So at the times when I knew we were going over the edge, the driver carefully and methodically maneuvered this beast easily along to our destination. The days in Zaruma were a true march back in time and this bus ride punctuated the divide. But now that I’m in Loja, life is different. Somewhere in the vicinity of 200,000 people call Loja home (accurate population figures and, for that matter, municipal boundaries are more of a concept than a reality in much of South America). 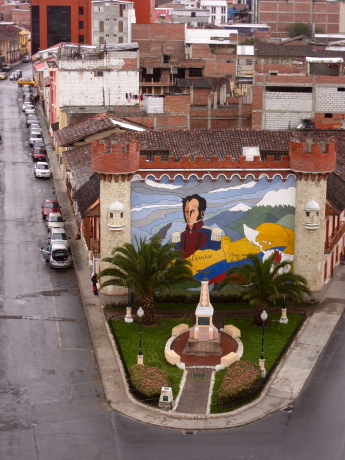 Considered by the rest of Ecuador as the jewel of the south, this city holds a long memory of mining and agricultural wealth. But it’s the 21st century. The old days were nice and there will always be respect for history (Loja is one of the oldest cities in Ecuador), though I get a clear message here that folks want nothing more than a comfortable middle-class life. And who can blame them? With the wonders of cable/satellite TV, dubbed Hollywood movies, and the Internet, all the excitement of the outside world beckons, and many here have answered. They have seen much that favors the attraction of a comfortable life and have decided to follow this dream. It’s the American dream, but it’s not exclusive to the US. This is also America, America of the South, and let no one forget it. So there is a small and slowly growing expat population here, and these retirement publications are all singing praises for Loja. Of course the result of this favorable press is that expats are moving here. But they are in no way as visible in Loja as the expats are in Cuenca, where they have seemingly taken over the Centro Historico, or are they as visible through sheer numbers, as they are in tiny Cotacachi. But expats are here and they do blog and the blogs make for some interesting reading. As regards expat life, Loja is still in the first stages of “colonization” and this means that the transplants here are a hardy bunch, by necessity speaking Spanish, and who are quite content flying under the radar and not flocking or swarming as in the other locales. These new Lojanos are happily leading the middle-class life too and fitting in quite well with families tracing Lojano roots back in some cases to the founding of the city in 1546. Ah, but nice though it may be, that same middle-class longing is where problems arise. Rafael Correa has changed the face of Ecuador like no other president before him. Regardless of how one applauds or rejects his views, his redistribution of wealth essentially made a new country. In multiple comparisons to other South American nations, Ecuador has lifted itself from an also-ran to a contender in virtually all aspects of social metrics. Correa’s administration has lifted more people from poverty than all of his predecessors combined and the country is now in the top tier of wealth, prosperity, and individual contentment across all factors of life in Latin America. Crime is down and happiness is up. Because of the wealth re-distribution there is now in Ecuador a large sector of the population that not only can simply dream about material gain, but actually achieve it through individual effort. This has never happened before and the people who this message was intended for have embraced it whole cloth and gladly worked hard to move up the ladder; out with the old ways and all aboard for the new ones. Yet differences exist here in the beautiful and rugged south. Unlike Cuenca, the cultural capital of Ecuador, or Cotacachi, near to the world market of Otavalo, or the main cities of Quito and Guayaquil, Loja is off the (international) tourist trail. It is at the bottom of an isolated valley, nearly 7,000 ft above sea-level, and surrounded by rough and mountainous mining country. 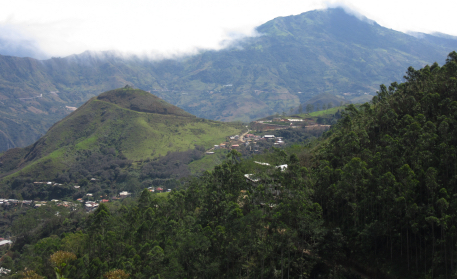 Loja therefore is at the mercy of its geography, and as a result of these defining landforms the city, like any city anywhere in similar circumstances, has an insular outlook on life and the values that define it as a community. Seeing the world of the outside and how the Loja of old compared to that world, and seeing progress as good thing, it was only natural that Loja too would be moving forward. If hard work and a clear vision were the antidotes to stagnation, then Lojanos were ready for their share of the rewards. It would be worth it for now and for the future. But at what cost? When I arrived here last Thursday I had several immediate tasks before me. In order to stay on the road I have certain regular chores and the occasional “one-off” task that come up. This last week I needed to have some laundry done, a haircut, and some forms filled and mailed back to a US bank. I also wanted to purchase some palo santo. This sweetly aromatic wood is burned in curandismo ceremonies and next week I begin a 12-day retreat hosted by 4 curanderos. The plan was to purchase quantities of palo santo for each of the shamans as symbolic offerings. Once I leave Loja I will be again in isolated country south of Cuenca and unable to locate such things. So Loja is where I had to find my palo santo. Booking a room in a centrally located hotel in colonial cities has many benefits, not the least of which is convenience. There is a reassuring sameness to the layout of old Latin American cities. Each has a parque central: a green-space (sometimes more green in concept than in currency) which will have fronting it the city cathedral, the local governmental offices, and provincial and/or federal agencies as well. Radiating outward from the park will be the supplementary and complementary businesses, shops, and other modes of commerce that keep the community operating. The tailors, the hardware stores, the cyber cafés, and pharmacies, restaurants, and more. Big cities and small pueblos; this layout is both regular and reassuring. Among these surrounding stores will also be the mercado central. This will be the grand market selling everything from local produce (which in Ecuador is astounding in variety, beauty, taste, and incredibly low prices), meats: both the butchered and often the live still clothed in feathers or fur, toys for the tots, sweets for both the tooth and the heart, umbrellas, shoes and boots, basketware, items for the kitchen and home, and many, many other items in a large warehouse or series of warehouses with running kids, pleading mothers, hawkers for both licit and illicit goods; a fascinating place to watch one’s belongings while weaving through the always crowded aisles. 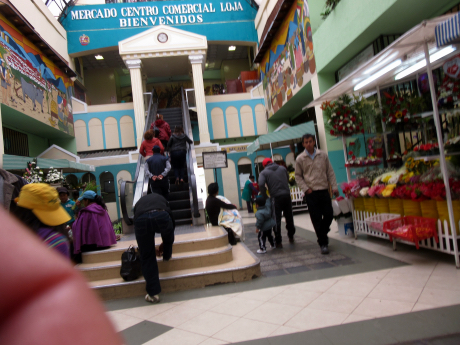 Loja’s grand market is barely 2 blocks from my digs, the Hotel Podocarpus, and after scouting it out on Thursday just before the 6pm closing, I knew that checking off my tasks would be a snap; there was even an internet café, so I could print out the forms for the bank. The central post office was 2 blocks in the other direction from my hotel. Perfect! At least mostly so. After finishing up most of my tasks at the mercado with a $2 haircut (and it looks like a $2 haircut too!) on the top floor amidst the row of barbers, I set out to find the palo santo. 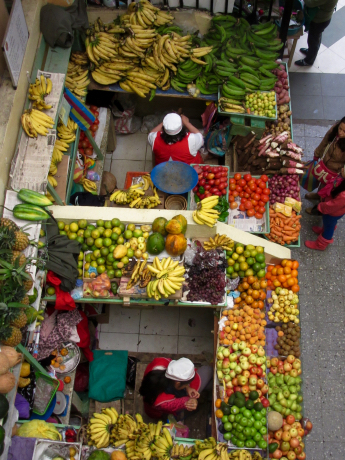 In Quito, Cuenca, and many other communities along the major transportation routes, tiendas de remedios (shops selling folk remedies) seem to be on almost every street corner. Yet I couldn’t see any, either in the mercado or along the side streets lined with shops selling everything but remedios. So I asked one of the vendors in the mercado who gave me a puzzled look and then pointed me off in some vague direction elsewhere, a common gesture when someone doesn’t know something but can’t bring ones’ self to admit it. So off I went to another sector, got the same treatment, and repeated this a number of times until the husband of one of the earlier vendors found me several aisles over and pointed out a tiny closet of a shop one more aisle down. Finally! Success with what turned out to be the last remedio shop in Loja. It was getting late with rain threatening, so I was thankful that I did find my palo santo, and that the old man selling the flower-waters (floristas), trinkets, salves and such had 4 bundles left. He was both quite pleased and puzzled to find a gringo as a customer, and after our transaction admitted that not only was he the last, but that his supply of palo santo had dried up from over-developing the forests for farmland. He also told me that for 10 years or so, fewer and fewer people are following the old ways and that he was going to close down this last of the remedios in Loja. In their climb up the material ladder, Lojanos have willingly forsaken indigenous ways and plowed up the once plentiful palo santo forests. For progress. Other communities here in Ecuador, ones located on busy and regular transportation routes still accept the old ways and have comfortably integrated them into newer ways of living. There is no real conflict in those cities and both beliefs of health and healing exist symbiotically. However, these folks here in Loja, walled in by the beautiful but culturally stifling mountains, concluded some time back that it was an either/or choice and made their move forward by saying goodbye to traditions that had been in place for millennia. Something was lost here in Loja. This entry was posted in Uncategorized and tagged ayahuasca, Cotopaxi, Cuenca, expats, Guayaquil, health, indigenous, Quito, Spanish language, Zaruma on 2015-07-12 by kmalivuk.